Photographic postcard of “Barry,” taken by Morris (last name unknown. Cyannotype. Postmarked 3 August 1912. Addressed to Miss Caroline B. Freeman, Jefferson, MA. Although the summer travel season is past, I can’t resist a belated post on car travel with dogs. 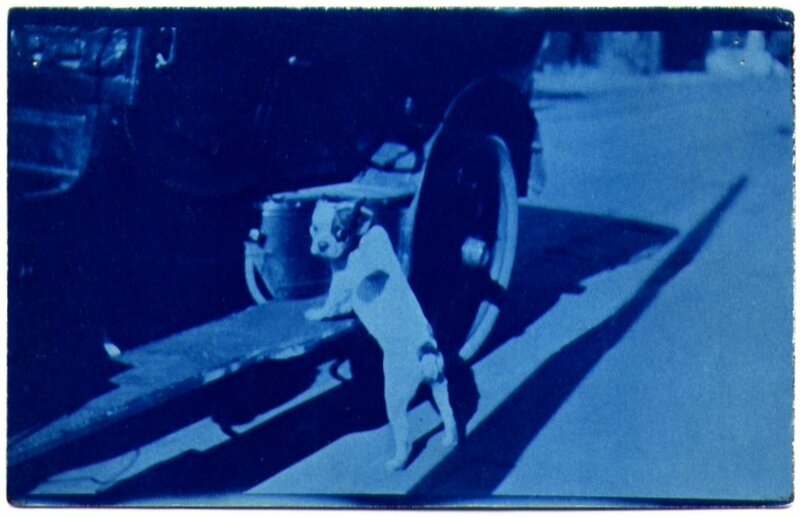 In my research for Pets in America, I found evidence that dogs loved traveling by horse-drawn carriage, and I have to admit that I was not surprised. There is something about riding in a vehicle that stirs the canine soul. When families began to purchase their own cars, many happy dogs, like Barry here, began to ask for a chance to ride along. In the 1920s, motor vehicle owners began to improvise with homemade trailers or cabins on truck beds. (Wally Byam, creator of the Airstream trailer, created his first travel shelter on the back of a model-T in 1929.) By the 1930s, travelers with limited budgets or DIY skills still built their own trailers, but companies also made and sold a variety of folding campers and trailers of wood and metal. “Silver Lake Aug. 1951.” Snapshot; photographer unknown. After World War II, as more American workers received vacation days as part of the terms of their employment, trailer vacations became even more popular — and family dogs went along. 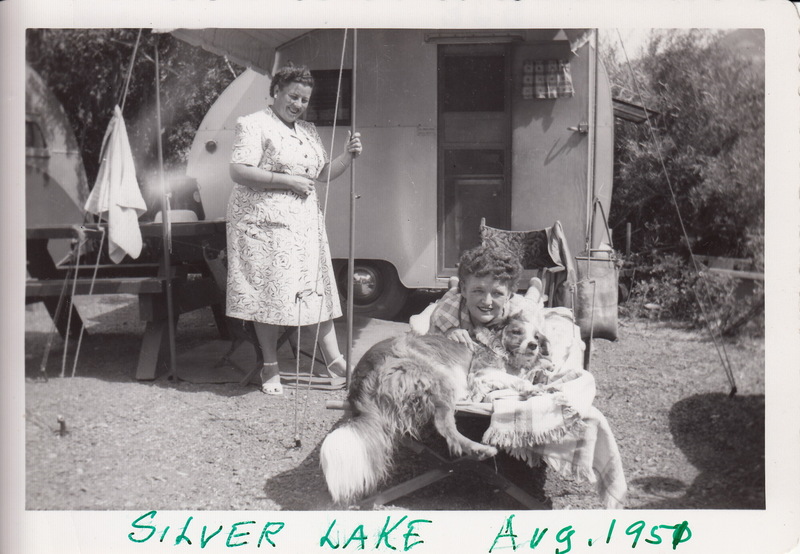 This 1951 snapshot taken at an unidentified “Silver Lake” (there are a number of them), shows two women and their collie dog at their campsite. Of course, not all family dogs had to rough it like this. 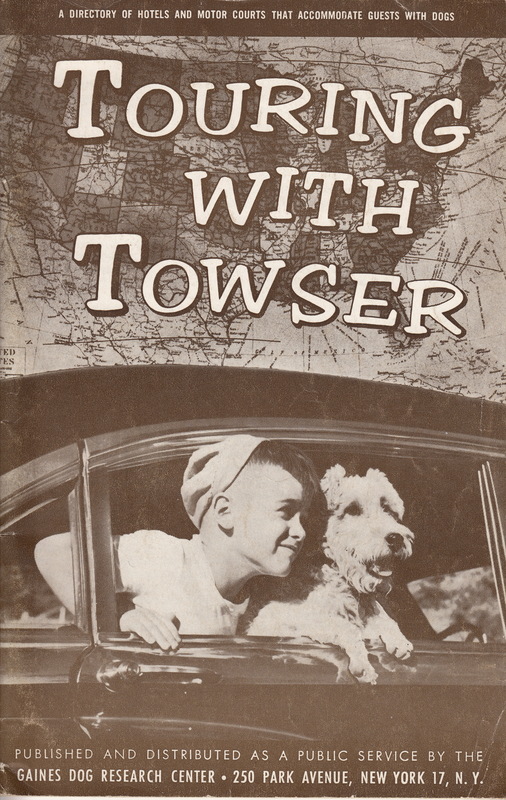 In 1960, the Gaines Dog Research Center, a unit of the Gaines dog food company, published this small paperback booklet, Touring with Towser. It contained nothing more than a list by state and town of hotels and motels (“motor courts”) that were willing to accept dogs. I like the cover image; the boy and the dog are riding together in the back seat and having fun looking out the window. I remember sharing the back seat with the family basset hound, Gussie, when I was a child — she was a seat hog. 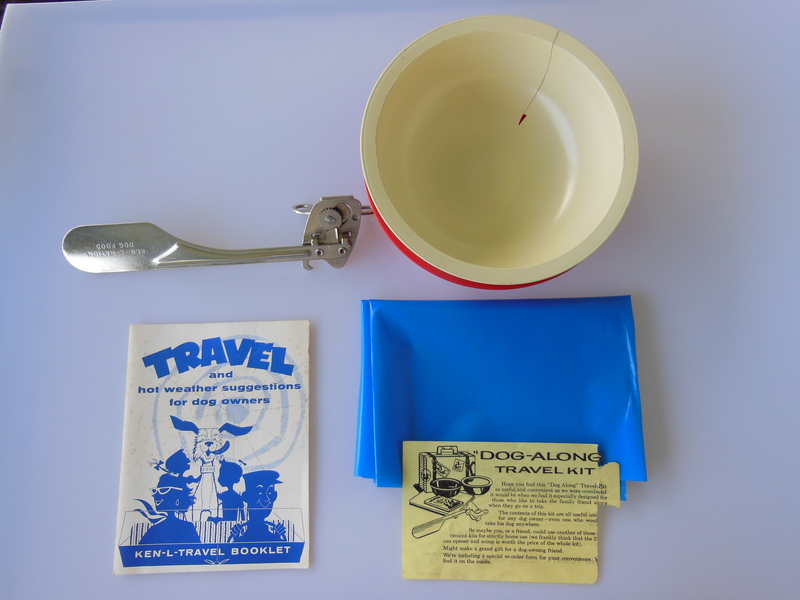 Contents of “Dog Along Travel Kit.” Two plastic bowls (stacked); a plastic sheet to protect the hotel room floor; a can opener; and two brochures. Of course, the well-traveled family dog needed to be able to dine and drink in comfort on the road. A number of novelty companies produced inexpensive travel kits with bowls, place mats, can openers and bottles for water. This one was a premium from the Quaker Oats Company, which owned Ken-L-Ration at that time. 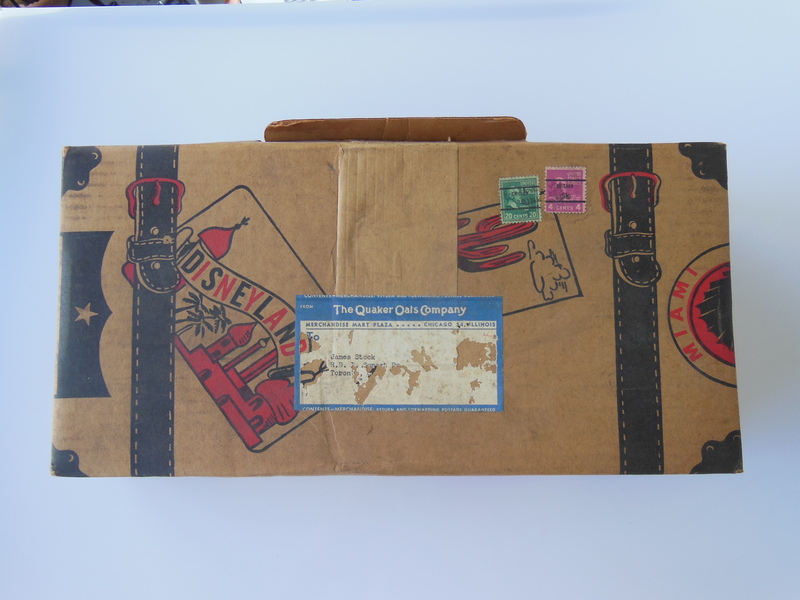 The cardboard “suitcase” has a design of travel decals, suggesting that the family dog was as well traveled as the rest of the gang. — notice the one for Disneyland. The brochure offers advice on traveling with a dog in hot weather. Dog Along Travel Kit, premium for Ken-L-Ration dog food, Quaker Oats Company, ca. 1960. Printed cardboard. Previous A Television Light and Fishbowl in One!